The next two chart give a great overview of the government finances in the first decade of this century in the Euro Zone. It also shows which countries broke the rules of the Stability and Growth Pact. Which says countries can't have deficits higher than three percent and debt higher than sixty percent, both as a percentage of GDP. Before the crisis Ireland, Spain, Estonia, Luxembourgh and Finland were the only countries that never broke the rules. Especially notice France and Germany, which both had a debt higher than 60% every year since 2003. France had a deficit higher than 3% for 2002-2004 and Germany for 2001-2005. 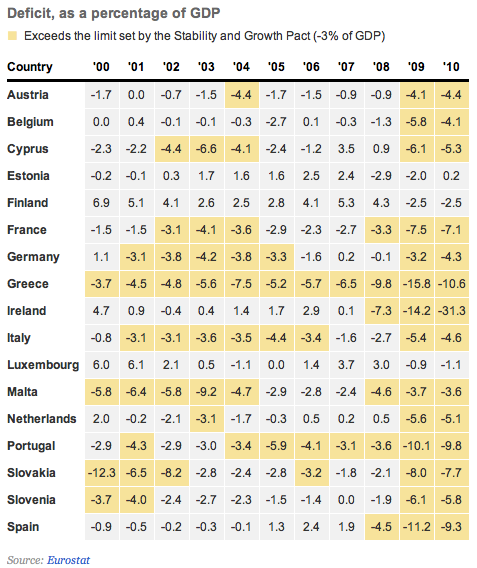 This chart shows the deficits per year for all the Euro Zone countries from 2000-2010. 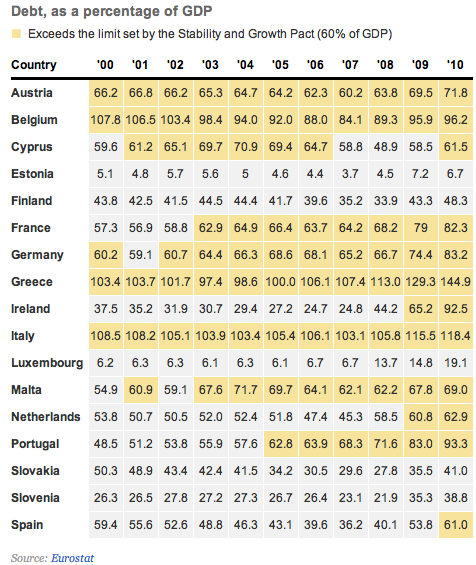 This chart shows how the government debt changed per year for all the Euro Zone countries from 2000-2010.